Happy belated Thanksgiving! What are you thankful for this year? The pooches of Orphans of the Storm® would certainly be thankful to find their new “furever” home with a loving family. Here are some you should meet on your next visit! 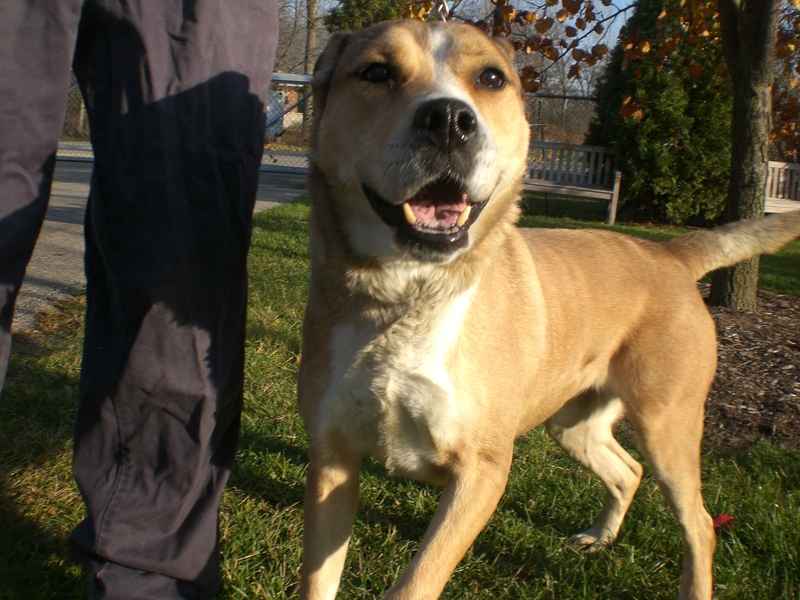 Charlie the four-year-old Mountain Feist mix is a real sweetie. Haven’t heard of a Feist before? Me, neither! They’re mostly found in the Appalachian region, but Charlie found his way north to Riverwoods! 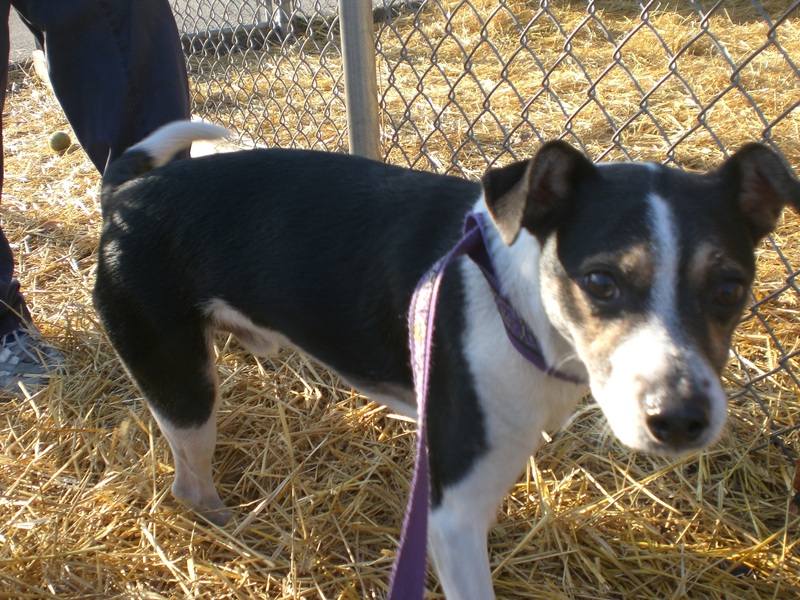 Charlie has the looks and personality of a Terrier: cute, smaller than many other breeds, lots of energy, and, most importantly, lots of love. Charlie was leading the way on our walk and sniffing every which way. When he noticed I was kneeling next to him, he put his little front paws in my lap and gave my chin a few doggy kisses. Charlie is the type of dog who gets along with everybody, people and dogs alike. His little tail is always wagging. Come meet Charlie and see if he’s a good fit for your family! 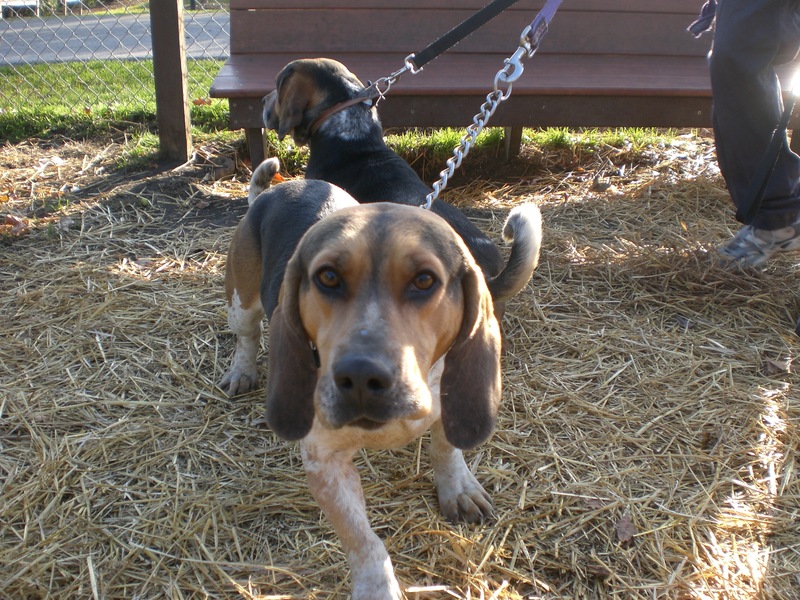 Warren and Andy the two-year-old Basset Hound mixes are so adorable! The brothers came into the shelter together, and would be especially thankful if they could find their new home together. They’re best friends and stuck close together even when we were in the run and they were off-leash. Since they’re scent hounds, their noses are almost always on the ground (and they sometimes run into each other because of it, which is super cute). You will get double the cute with Warren and Andy! Unfortunately, I wasn’t sure which one was Andy and which one was Warren, but they each have unique markings, so once you know who is who it will be easy to keep track. 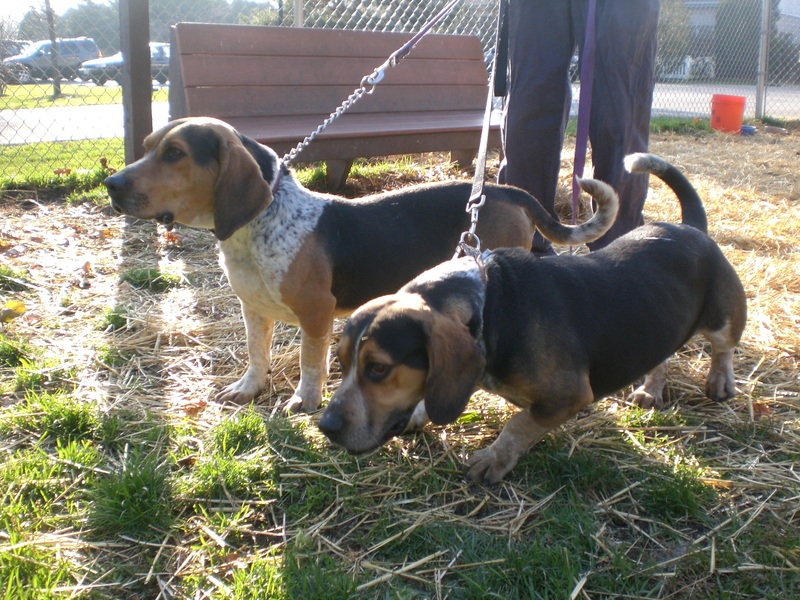 These two are sweet dogs (which Basset Hounds are known to be) who will come galloping towards you when you call for them and run right into your lap. Those faces are impossible to resist! 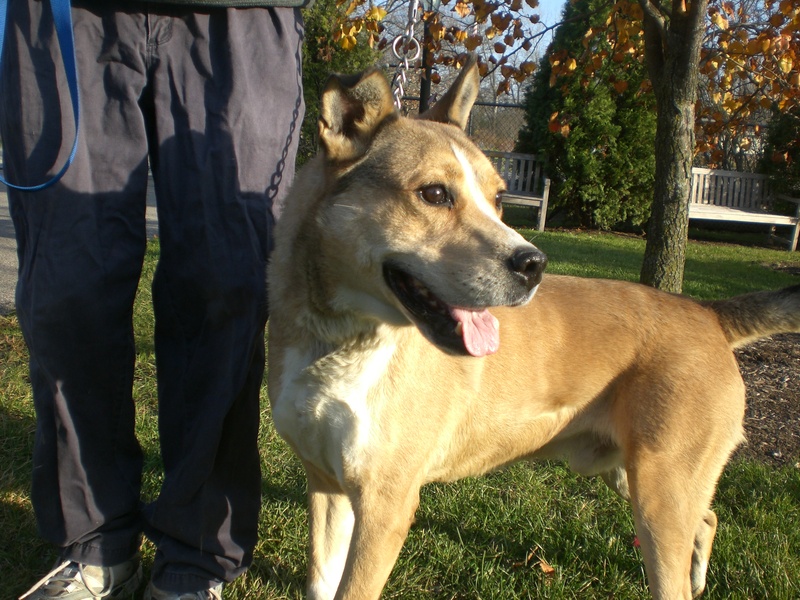 Reebok the eight-year-old Shepherd mix acts more like an eight-month-old dog–in a good way. 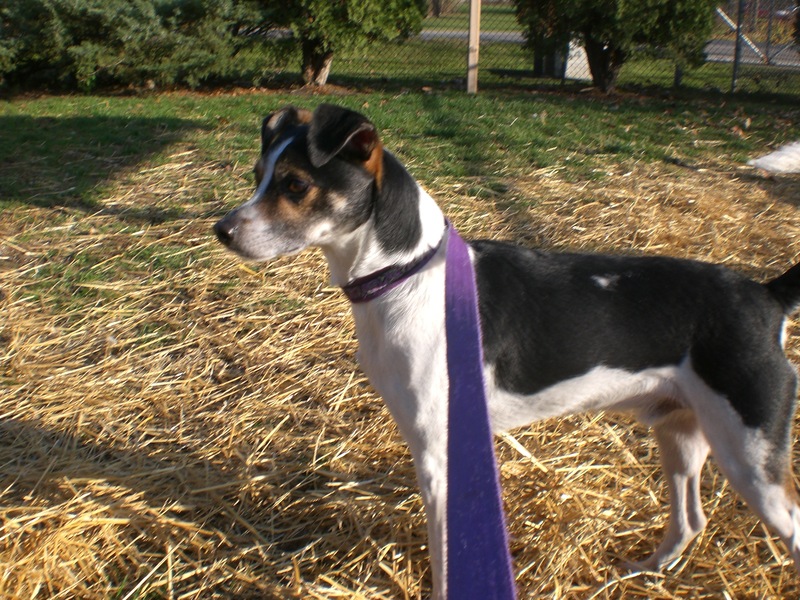 He has lots of energy and would be a great running partner, especially if you happen to be wearing Reeboks! If you’re not a runner, Reebok would be happy to go on walks with you too. Reebok is a very handsome dog, with his brown-and-white coloring and perky ears. His fur is soft and fluffy and he enjoys being pet. He also gets along with other dogs. He had a kennelmate that I also took out, but she has already been adopted! Reebok is still waiting for the perfect family to come and bring him home with them. 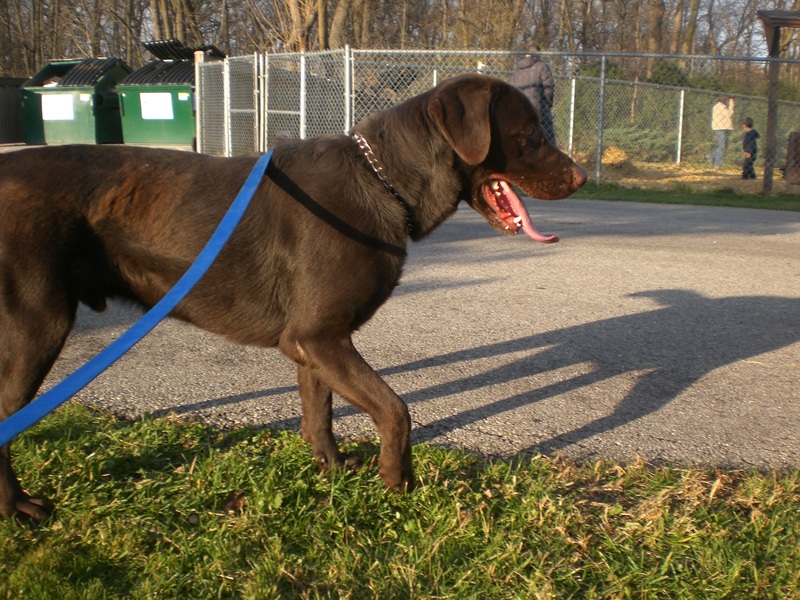 Coco the four-year-old Chocolate Labrador Retriever had a cast on his leg at the beginning of his time at Orphans of the Storm®, but you wouldn’t be able to tell that now! 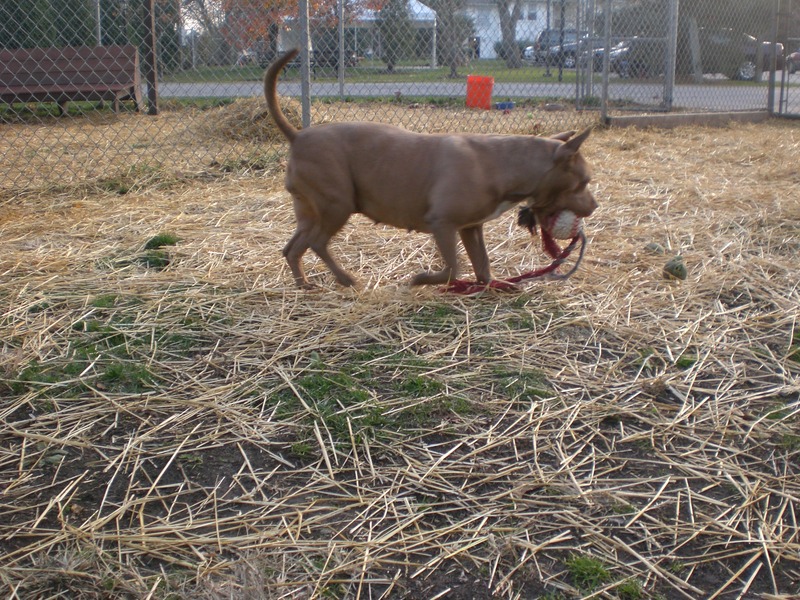 Coco was ready to run and play as soon as he was out of his kennel. In typical Lab fashion, he is a happy dog with a constantly wagging tail. Coco wanted to be everywhere at once when we first started our walk, but he calmed down quickly. I sat down on one of the benches under the tent and Coco came up and leaned against my legs while I scratched his back and ears. He was interested in all of the people and dogs walking around us, and would sometimes bark hello to them. 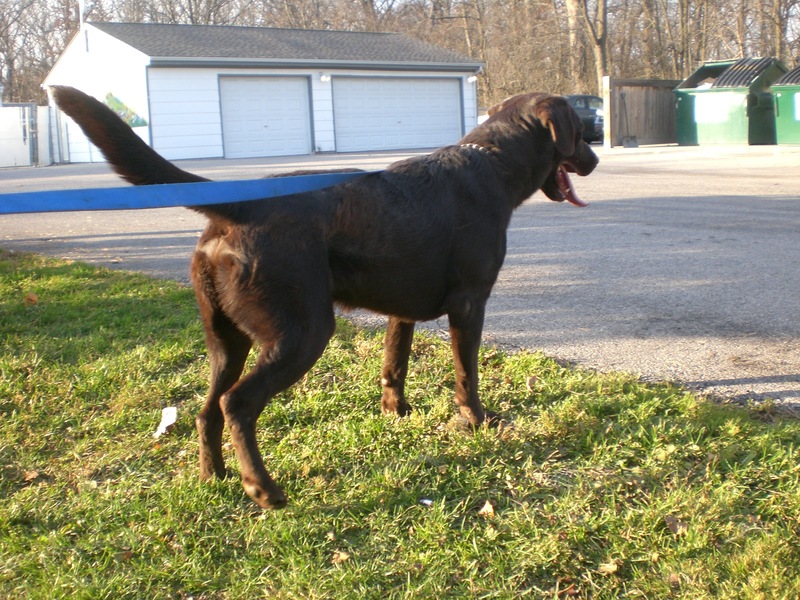 Chocolate Labs don’t last long at the shelter, so if you’re interested in Coco, come in soon! 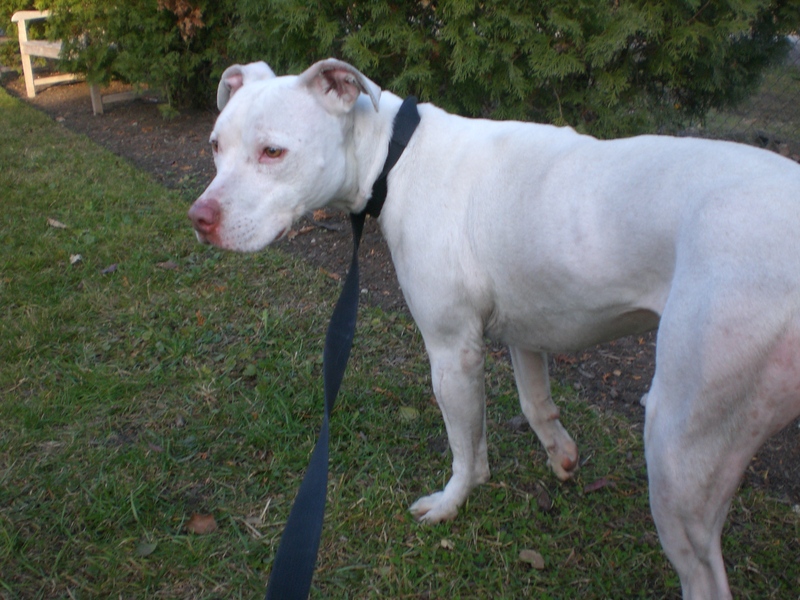 Winter the six-year-old Pit Bull Terrier mix loves people; she just doesn’t love dogs so much. Winter is the first dog I have taken for a walk beyond the shelter’s fence! Winter loves going for long walks and does pretty well on the leash. When we came back from our walk, I took a seat on one of the benches and Winter happily climbed onto the bench and sat next to me. She gave me a few gentle doggy kisses and then hopped back off the bench to walk around some more. Winter is on the smaller size compared to some of the other Pit Bulls at the shelter, and she’s especially cute because of it. Trixie the two-year-old Pit Bull Terrier mix is another happy dog who would be even happier with a family of her own to love. She is super cute, with ears that sometimes stick straight up and sometimes flop to the side. She is a playful girl with lots of energy. Trixie and I went into one of the runs, where we found a plastic ball and some tennis balls. 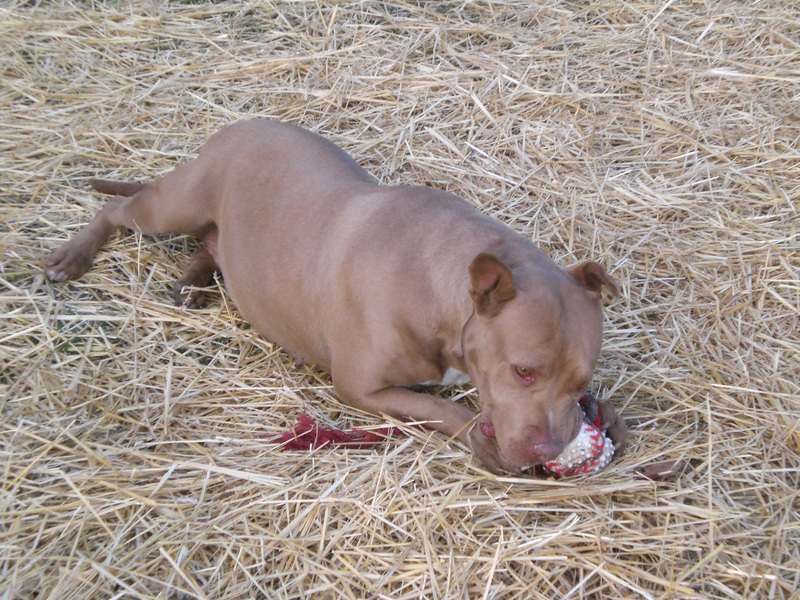 Trixie loved to play fetch with the tennis balls, and loved to chew on the plastic ball. You’ll have to get some sturdy toys for this girl, because she is an excellent chewer. Trixie didn’t want to part with her ball when it was time to go back to her kennel, so she carried the tennis ball with her on the walk back. 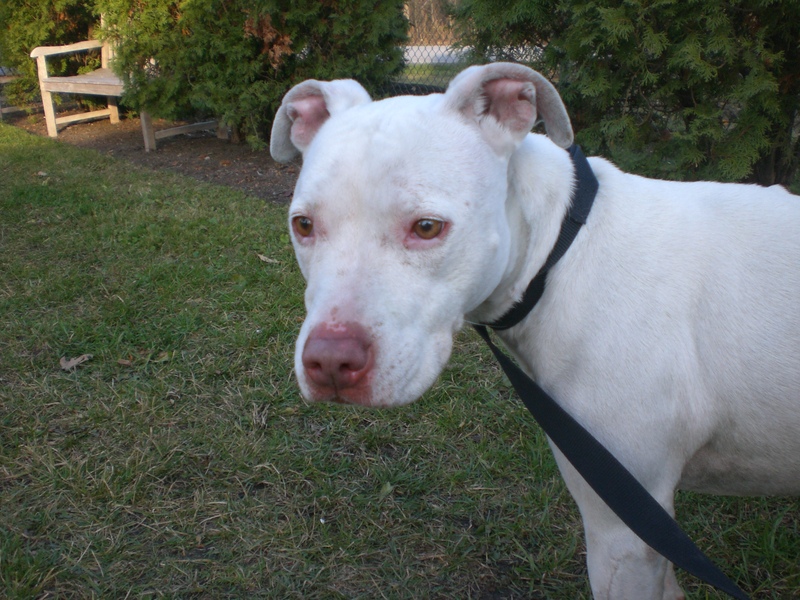 If you’re looking for a dog who loves to play, come meet Trixie! Trixie will need to be spoiled with lots of toys! Posted by Meet the Pooches on November 25, 2012 in Dog Profiles and tagged adoption, animal shelter, Basset Hound, Chicago, dogs, Labrador Retriever, Mountain Feist, Orphans of the Storm, pets, Pit Bull Terrier, Shepherd, Thanksgiving.